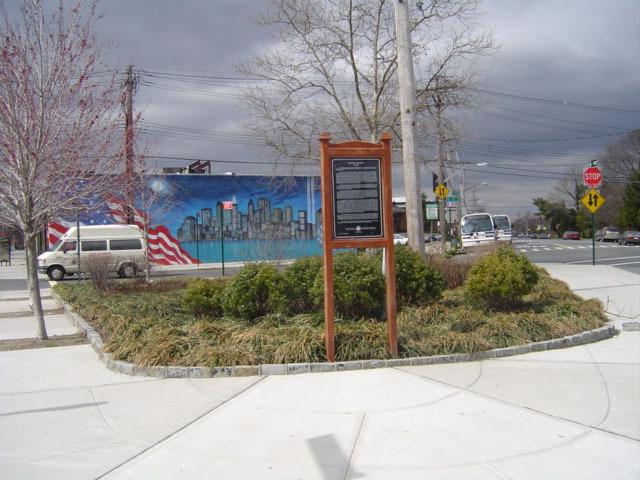 This triangle, located at the intersection of Avenue U, Veterans Avenue, and 71st Street, is named for Bergen Beach resident and Vietnam War veteran Private First Class Cosmo Leonard Barone. 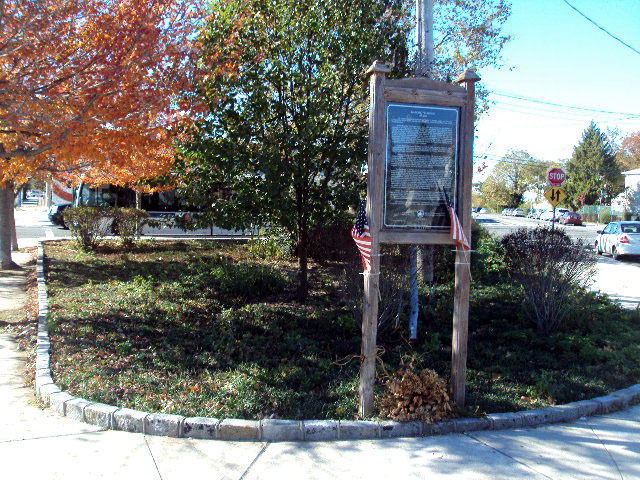 Before the arrival of European settlers in the 1500s, Bergen Beach was first inhabited by members of the Canarsee tribe. These Native Americans utilized the area’s wilderness terrain, shoreline, and nearby islands as sources for the gathering of food. During the seventeenth century, the Bergen Beach area became the property of Hans Hansen Bergen. In the 1890s, Bergen’s descendants sold the land to Thomas Adams, Jr. and Percy Williams who aspired to create an amusement center that might one day rival Coney Island. Initially successful, the businessmen’s grand dreams, however, failed to survive the Great Depression. The neighborhood continued to remain relatively undeveloped until after World War II, when numerous small single-family homes were erected at the suburban location. As a result, most buildings in this neighborhood are no larger than six stories in height. Cosmo Barone was born in Brooklyn on April 19, 1944. Attending William E. Grady Vocational Technical High School, the young man planned to follow his grandfather’s craft of cabinetmaking, but, as the situation began to destabilize in Vietnam, Barone was called to service in the United States Army. After basic training at Fort Jackson, South Carolina, Pfc. Barone was assigned in late 1965 to Company A of the 2nd United States Infantry Division, 2nd Battalion, and sent to Southeast Asia. During his tour of duty in Vietnam, Pfc. Barone was injured several times, first receiving wounds when he jumped from a helicopter into a trap of sharpened bamboo stalks and later when he was caught in a jeep explosion. On April 30, 1966, Pfc. Barone was engaged in a search-and-destroy mission when his contingent came under fire. Rushing to the aid of his sergeant, Pfc. Cosmo Barone was hit by enemy assault rifle fire. Losing the use of his legs and an eye in the ambush as well as suffering several abdominal wounds, Pfc. Cosmo Barone was evacuated from the field of combat. He was flown first to the Philippines and then to New York for medical treatment and recovery. During his recuperation at a veterans affairs hospital, Pfc. Barone came to be known as the “funny guy” of his ward, cheering up fellow veterans from World War II, Korea, and Vietnam with his unique brand of youthful humor. Pfc. Barone was discharged from hospital care in 1969. He returned to his Brooklyn home to resume his civilian life, but continued to visit his former hospital mates with the assistance of a specially configured 1968 Riviera (which allowed him to drive with switches instead of pedals). In April 1971, after celebrating his 27th birthday with friends and family, Pfc. Barone retired for the night and passed away in his sleep from complications suffered by the wounds he had received in the Vietnam War. During his tour of service, Pfc. Barone was awarded the Purple Heart, the Combat Infantryman Badge, the Sharpshooter Badge with Rifle Bar, the Vietnam Service Medal with a Bronze Service Star, and the Republic of Vietnam Campaign Medal. His name is listed among the fallen on both the New York Vietnam War Memorial and the National Vietnam War Memorial in Washington, D.C. In 1982 this site was renamed by Local Law for Pfc. Cosmo Leonard Barone. In 1999, four red maple trees (Acer rubrum), a london plane tree (Platanus acerifolia), several woody shrubs, and a small magnolia tree (Magnolia spp.) were planted in this triangle.